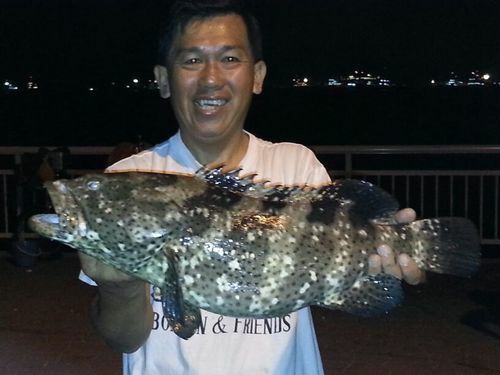 Ah Poh caught this 4.5kg black spotted grouper by a handline lower down below the jetty. The fish took the bait and run further in below the jetty. He had to pull and fought with it before manage to surface it. I was called to scoop it up with my net. I took the photo on his behalf. 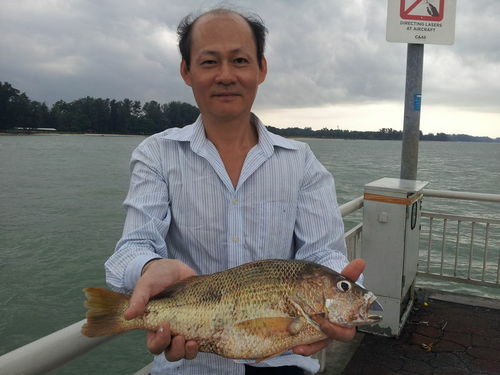 Ah Chuan caught this mangrove jack about a kilo in weight with a handline lower below the jetty. He also caught a small wolf herring by cable car rig. It already 8am….full tide this morning was at 10.48am….so quickly I grab a packet of frozen tamban and headed down. Reach there Ah Chuan just caught a mangrove jack by handline…I setup and casted out…Follow by jigging fresh tamban.. The sky on the western side already very dark and the wind is coming from that direction…Its a matter of time the rain will arrive. After getting some tamban…I prepared to run…But at this time Ah An n Xio fan arrive…So I help to setup the canvas…now has to stay for the rain.. Very shortly rain arrived…hide below the canvas about fifteen minute and the rain pass…Change bait and went to jig for tamban again..When I back…I saw my line slack….I pickup the rod n strike…Yup..heavy at the end…then i feel got something struggling at the end…..I was thinking could it be a puffer fish….Slowly I wind back….it surface….Wow!…a nice size grouper…..I ask Ah An to grab my leader and haul it up…Estimate weight about 1.7kg..
K caught this stingray after some hard pump n puff.. His reel alarm went off when the tide was on the way up. Although there was a strong southern wind blowing….the current was smooth. The fish took the bait just after he had casted out. 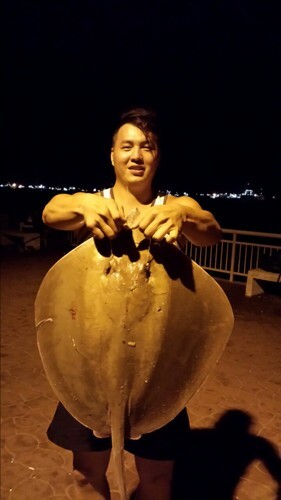 I gaff it up and it was a male ray.